Nearly 100 people against plans for treated sewage to be deposited into a cave at a north Cornwall beach gathered nearby as councillors visited the site. The Youth Hostel Association (YHA) wants to install a £250,000 system to discharge wastewater into Long Cave at Treyarnon Bay. 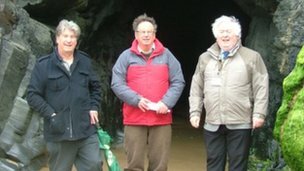 The objectors gathered at the cave as the councillors visited to raise health and reputation concerns. Cornwall Council will make a final decision on the plans at a later date. It said the waste would undergo "physical, biological and UV treatment" before being discharged in high tide at night. There would be facilities to store waste for 48 hours and a back-up system in case of error. But resident Julie Spicer said: "Two days is not enough because there will be five or six days when the tide will go nowhere near the cave. "It's soft sand, children play there, people build sand sculptures which last for several days." St Merryn Parish Council said: "Trying to maintain the image that Treyarnon is a clean and safe beach will not be an easy task. "Public perception is likely to focus on the fact that there is now an outfall present and other businesses such as shops, vendors and even the YHA itself will surely suffer." The Environment Agency has issued a permit allowing the treated sewage to be discharged at high tide during the night. YHA said the alternative of running a pipe half a mile to connect to the mains sewer was not a viable option.